The writer’s job is to sequence information and ideas in a text so that the reader does not have to make an effort to follow the writer’s argument or line of thought – when ideas are sequenced in this way, they flow well. The organisation of ideas in sentences and paragraphs is very important – if the ideas are well sequenced, the reader can still understand the text, even where there are quite a lot of grammar mistakes. The hook and eye technique is a way of illustrating how writers connect ideas, create coherent text and therefore build an argument – this technique is illustrated in the text below. The words in rectangles (the eyes) refer back to the idea in the circled words (the hooks) and develop it in the next set of circled words. Readers unconsciously look for hooks and eyes to understand how the text is connected and developing – without hooks and eyes, readers struggle to make sense of the text. If English is your first language, or if you are accustomed to writing in English, you use this strategy without knowing it. However, writing in an academic text often requires readers to express complex ideas using unfamiliar vocabulary and grammatical structures and many novice writers get lost in a “spaghetti” of disconnected ideas. 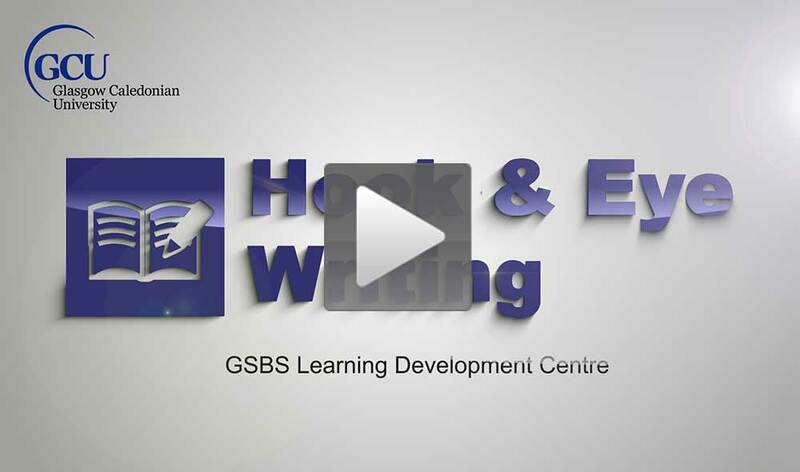 When editing your writing, check that the ideas in sentences or paragraphs are logically connected by making sure that there are hooks and eyes in your text. Download an example of Hook and Eye Writing.